Includes: 1.8-liter pot, strainer lid, two 20-fluid ounce insulated mugs with sip-it lids, two 20-fluid ounce bowls, two retractable foons, storage bag that doubles as a sink basin. The bottom line: The most important qualities I evaluate in a cooking system are weight, size, and ease of use. The GSI Outdoors Pinnacle Dualist Cookset scores highly in each of these categories with its nearly unmatched lightness, sturdy durability, and multitude of easy-to-pack bits and pieces. From burly thru-hikers to the active family on a weekend backpacking trip, anyone will find it easy to instantly fall in love with this cookware. The GSI Outdoor Pinnacle Dualist Cookset. Stove not included. Photo by Emily Pennington. My first experience with the GSI Pinnacle Dualist Cookset was in mid-September, when the leaves were beginning to dull and the forests of Sequoia National Park were teeming with wildlife yearning to nab the last morsels of food before the cold winter months consumed the wilderness. I had never been backpacking before, and my boyfriend wanted to treat me to my first-ever trip before snow rendered the mountains impassable. After an exhausting 12-mile day at altitude, I collapsed onto a tree stump, famished, and began rooting through our bear canister for a handful of trail mix. In a flash, my partner had assembled a tiny backpacker’s stove and threw a spiffy, aluminum pot on top to bring some water to a boil. I strained my neck curiously at the grace with which he executed the task. What was this? So chic! So lightweight! And… insulated bowls with lids? It was love at first sight. 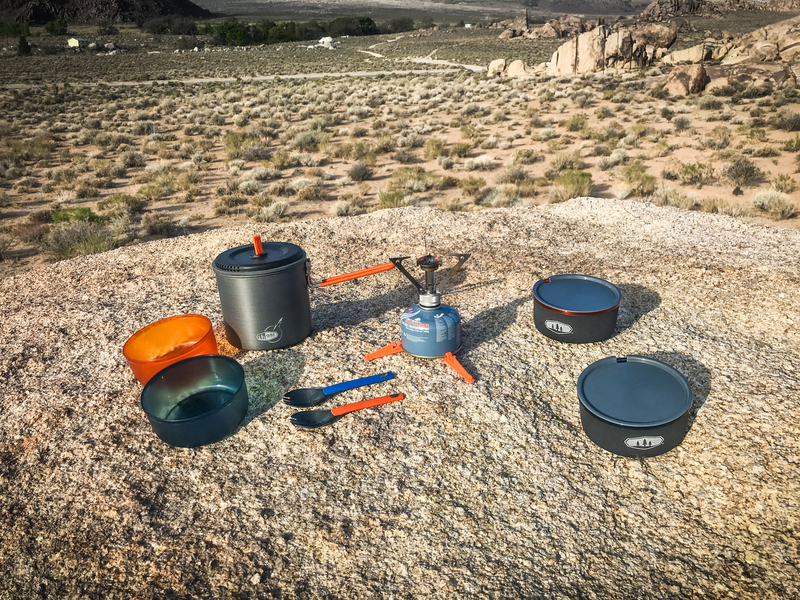 The GSI Outdoors Pinnacle Dualist Cookset is everything two people could ever dream of or need while out backpacking in the rugged wide open. Coming in at only 1 pound, 5.6 ounces, it is an insanely lightweight option for trail-addicts who still want the comforts of home when it comes to cooking a hearty camp meal at the end of the day. In fact, it’s so light that I’ve solo-trekked with it through high-altitude mountain passes and breathtaking alpine meadows – just remove one of the inner bowls and replace it with a small fuel canister to save on space! So what’s in the box? The GSI Outdoors Pinnacle Dualist Cookset comes with a 1.8-liter hard-anodized aluminum pot with a strainer lid for draining water or insulating to retain heat. The interior of the pot itself is coated with Teflon® for maximum non-stick culinary adventures. Inside are two insulated mugs with lids (with sip-it openings) that nest inside two color-coded bowls, all made from dishwasher safe, BPA-free, recyclable plastic. Two plastic “foons” rest inside the mugs and serve as multipurpose utensils, and the entire kit includes a welded sink basin that doubles up as a carrying case and storage bag. If you’re anything like me, you’ll likely leave the bowls and the mugs nestled inside of each other and savor the super insulation power of multiple layers. After all, this is meant to be a “dualist” cookset. One of the things I like most about this set is that, due to the pot’s excellent volume and the quad of sturdy bowls that fit inside, the set could easily serve four people on a longer thru-hike where weight and space are at a premium. The one thing I don’t love about this set are the “foons” it comes with. They’re flimsy, small, and break within a few casual uses. If I were you, I’d preemptively purchase a different set of utensils like the Sea to Summit Delta or the humangear GoBites set. They won’t fold down as small, but the lack of a middle plastic hinge will save you a lot of headaches in the long run. Due to its expertly constructed, hard-anodized aluminum metal, the pot in this kit holds its own even when cooking over a campfire. While it’s certainly safer and much more efficient to boil water and heat food using a fuel-powered stove, sometimes desperate times call for desperate measures, and I’ve seen this system perform beautifully when nestled atop a few carefully placed boulders inside a fire ring when my backpacking stove was out of commission on a long trip. The pot’s handle is even coated for a safer grip so you don’t burn your fingers when moving it around or pouring water into your tasty Mountain House meals. I’ve trekked all over California’s Sierra Nevada with this cookset, and it’s kept me well fed during a hailstorm on Mount Langley, a romantic alpine lake getaway in the high country of Yosemite, and even on a thru-hike of the High Sierra Trail that crossed the Sierra from west to east and finishing atop Mount Whitney. This thing is tough. I’ve never seen it get a dent, and scratches (yes, even on the pot’s interior) are rare. Even when my climbing partner let day-old gumbo cement itself to the inside of the pot’s core and used rocks and camp suds in a feeble attempt to get it clean, the Dualist’s pot stayed strong and is still very much alive and kicking.